Edgartown students work toward a cleaner Island, one recycling bin at a time. 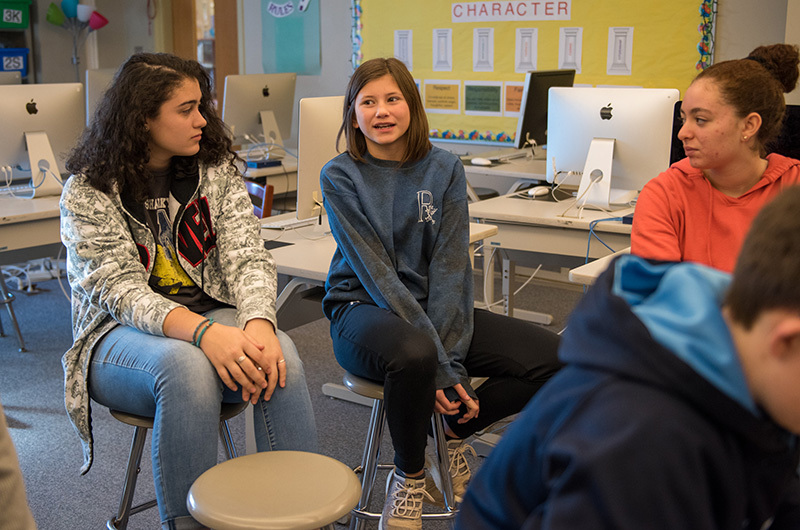 Kids at the Edgartown School are taking a proactive approach in educating themselves and their peers on the importance of sustainable living, and in particular, recycling. 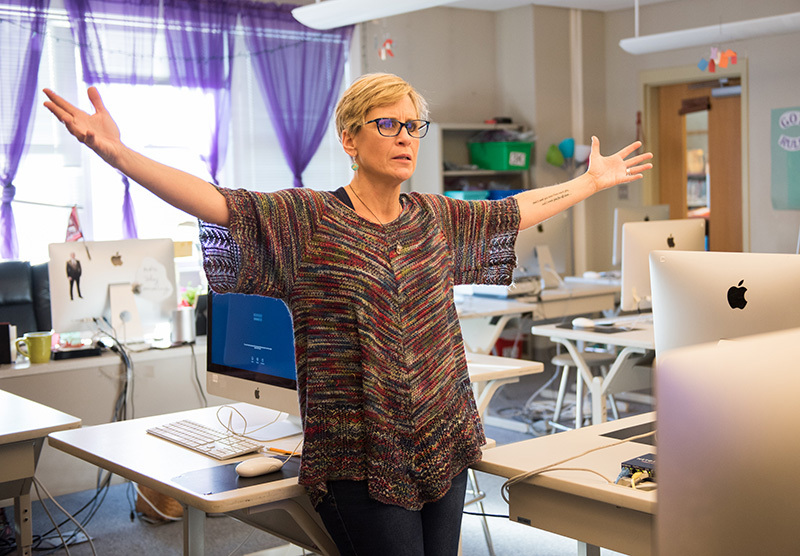 In Gail Gardner’s computer class, alongside home economics teacher Sarah Vail, children are learning ways to preserve the environment on the Vineyard through a number of simple but effective methods. Micah said people on Martha’s Vineyard can easily take their trash and recyclables to the dump, and the recycling part is free. Some students in Gardner’s class are from Brazil, China, and other areas around the world, providing varying perspectives on what it means to live sustainably. 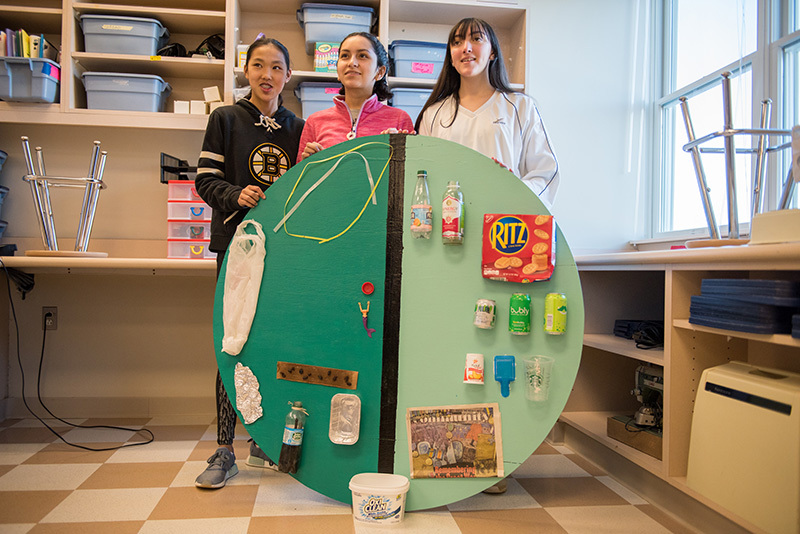 The students made three slideshows, one in Portuguese, one in Spanish, and another in English, showing how to separate recyclables into the proper groups, and giving examples of what can and can’t be recycled. Things like rope, twine, or electrical cords can get caught in the processing machines at recycling plants, therefore they should be thrown away with garbage. One student, Cassandra Silva, said sea turtles can mistake floating plastic shopping bags for jellyfish, and eat them. “That’s why it’s important to recycle plastic or reuse it,” she said. 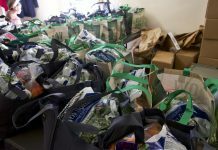 “If you have any bags, you can bring them to Stop & Shop, and they will recycle them. That’s one thing I learned,” she said. Micah said he was surprised to learn that bottle caps can’t be recycled along with plastic bottles, or they will clog the machines because of their small size. On Martha’s Vineyard, the means with which to recycle and minimize the municipal waste stream are fully available. But in small Brazilian towns, such as the one eighth grader Laura Gomes is from, most people do not have the means to pay private companies to properly dispose of their recyclables. Laura said her town did not provide recycling services when she lived in Brazil, and would instead collect both trash and recyclables and burn them together. “People treat trash and recyclables differently in different countries,” Laura said. “Nobody would recycle in my country.” Now, she said, she enjoys teaching her family the different ways to reduce, reuse, and recycle. One way, she said, is to make use of glass and tin containers that do not need to be single-use items. Many people would throw a glass orange juice bottle in the trash or recycling after it is empty, but Laura said her family uses glass bottles to store cooking oil after it has been used. 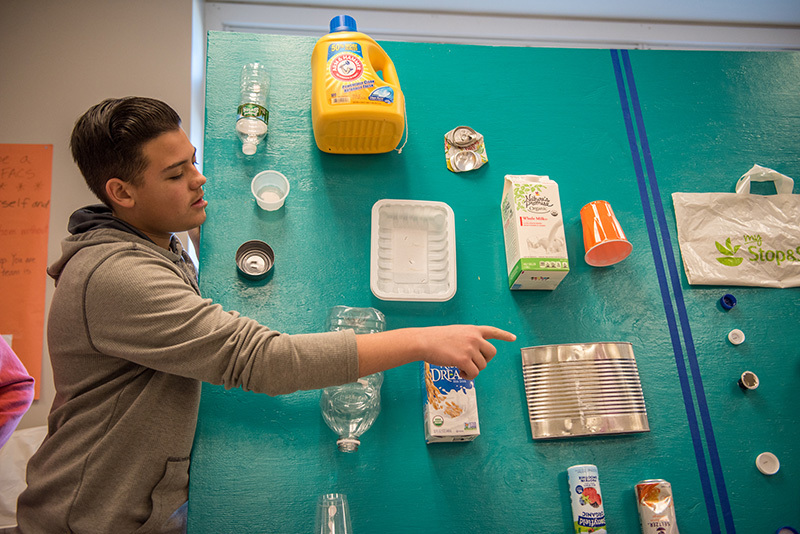 Another eighth grader, Jonathan DeOliveira, said his family uses empty glass bottles as flower vases and other household items. “Instead of going out and buying a flower vase for $5 or $10, you can have one for free, and it’s good for the environment,” Jonathan said. Some seemingly insignificant things involved with recycling are actually essential to the renewal process. Things like thoroughly cleaning out yogurt containers or other recyclable items before putting them in the bin prevent an entire batch of recyclables from being contaminated. The reason for this, student Evelyn Brewer said, is because workers at recycling plants don’t want to deal with “gross pieces of plastic and metal,” and will throw the entire bin away if there are leftover food scraps mixed in. Evelyn said taking the extra time to rinse recyclables can mean the difference between a brand-new product being created from a used one, and an entire bin being put back into the waste stream. Along with the slideshow presentations, the students also fashioned informational display boards on recycling. 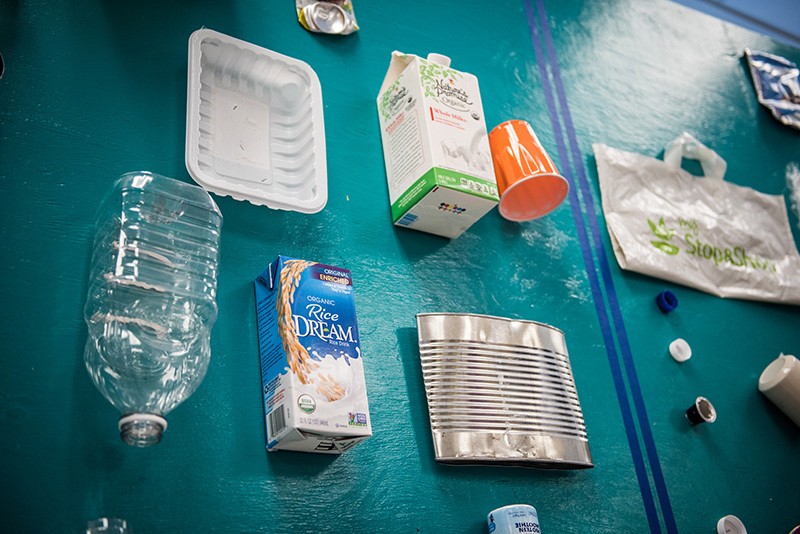 The boards contained tin cans, detergent bottles, and other recyclable items, with accompanying info on how to dispose of each item and what improper disposal could mean for the environment. The students also kept a worm bucket filled with compostable food scraps, like melon rinds, orange peels, and apple cores from snack time. 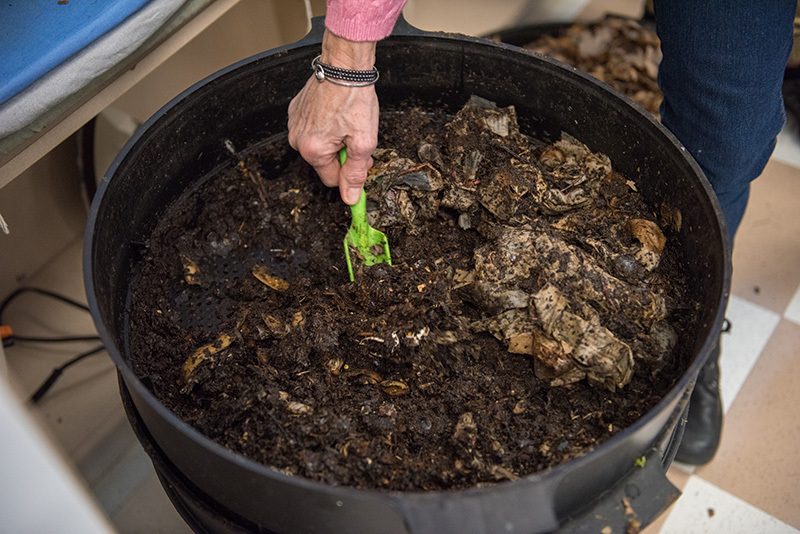 The Edgartown School cafeteria also utilizes sustainable practices by keeping its own compost pile, and growing fresh produce for meals in its own garden. 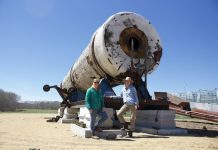 “We always try to teach the kids about the little things they can do in their own homes to think green and be good to the earth,” Vail said.